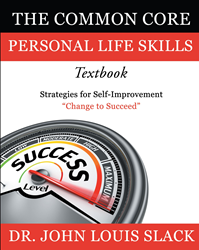 Recent release “The Common Core Personal Life Skills Textbook: Strategies for Self-Improvement” from Page Publishing author Dr. John Louis Slack is a prolific, enlightening work that explores the various concepts dealing with life, self-identity and success. Dr. John Louis Slack, Director of Health Education/Public Health at the University of District of Columbia, health/public health activist, entrepreneur, business owner, self-starter, creator of national dog registry American Rare Breed Association, community activist, scholar, writer and author, has completed his newest work “The Common Core Personal Life Skills Textbook: Strategies for Self-Improvement”: a gripping and potent work that aims to assist and help the reader improve themselves by guiding them through lessons detailed in this personal life skills textbook. “There are plenty of self-improvement books out there, but this one is my bible. Exhaustive, through and well organized with a template and comprehensive “play book for Life” that is a listing of common core life skills to immediately implement and enjoy success,” said Coach James McNally, 35 years NFL professional Football Coach that earned three (3) Super bowl Rings, brilliant businessman, Business Consultant, and Lecture. Published by New York City-based Page Publishing, Dr. John Louis Slack’s intellectual work explains the core life skills that will help improve life and excel one’s success. “This book is a perfect prescription to cure the void of informal and formal education, lack of mentors and role models that will help all of us become all that we can be,” said Bruce Hart, MD. Life time advocate of self-improvement plans. Readers who wish to experience this inspiring work can purchase “The Common Core Personal Life Skills Textbook: Strategies for Self-Improvement” at bookstores everywhere, or online at the Apple iTunes store, Amazon, Google Play or Barnes and Noble.